"On Thanksgiving Day 1950, in the extremely cold, windy mountains of North Korea, United Nations (U.N.) units of the American Army and Marine forces were taking a brief holiday break from their advance north. The mission to drive the North Korean army into China had gone as planned up to that point. However, military intelligence had failed to detect a massive build-up of some 60,000 Chinese Communist Forces nearby that suddenly joined the conflict in support of Communist North Korea and surrounded the much smaller American regiments. 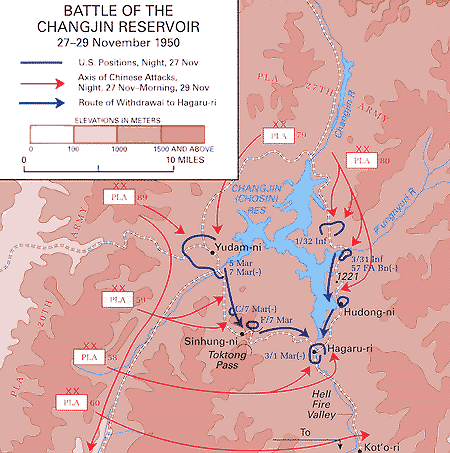 The American units were outnumbered and pinned down near a man-made lake high in the frozen mountains, known as the Chosin Reservoir….."
Yes, a very famous battle in that war. And USMC, Royal Marines and US Army units were involved. I worked with a Marine that was in this battle. He was driving a truck at the head of a convoy along a road on the side of a ridge. There were KIA's stacked on the hood. As he came around a curve a ChiCom machine gun in the middle of the road opened up on him. The only direction he could go was forward. He ducked behind the frozen KIA's on the hood and floored the gas pedal. He went over the gun feeling a bump. After he stopped he got out and his company commander, who was in a truck behind him said, "Purdy, that's one of the bravest things I've ever seen, you assaulted the machine gun position with your truck". Purdy later received the Silver Star and a battlefield promotion to LT for that engagement.